A European Cruise Experience onboard MSC Cruises! We look forward to introducing you to the distinct style of an MSC Cruises Mediterranean cruise or Baltic & Scandinavia cruise! From the world-famous authentic Italian cuisine to the personal attention and friendliness of an Italian crew, our guests are treated to the finest Italian hospitality afloat. In 2019 MSC Cruises will offer twelve ships in Europe! On all European cruises with MSC Cruises children 11 years of age and younger cruise FREE with their parents! Book early as family staterooms sell out quickly. 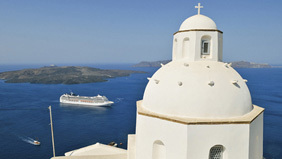 On the ships of MSC Cruises you will discover a perfect blend of European charm and modern elegance. Experience the genuine warmth and hospitality of our Italian officers. Savor a steamy cappuccino or a refreshing gelato with an ever-changing view. And taste the flavors of Italy offered by our signature La Cucina Italiana and New World Mediterranean cuisine. MSC Cruises uniquely blends maritime traditions, culture and famous Mediterranean cuisine to deliver the ultimate cruise experience while displaying a real commitment to the finest hospitality afloat. In essence, MSC Cruises has made true Italian service the heart of its business and its key point of differentiation in the cruise industry. Dining is delizioso with MSC Cruises! Imagine crepes Florentine, pumpkin risotto with truffle oil and lobster with coriander and anise. In each ship's main restaurant, dining is a special occasion with our renowned seven-course menu, including a different regional Italian specialty each night. We call our medley of fresh Mediterranean flavors, La Cucina Italiana. You'll take pleasure in the fresh taste of gourmet Italian food served in an elegant European atmosphere. Signature dishes designed by two star Michelin chef Mauro Uliassi in all a la carte restaurants. Drink Packages & Spa Treatments with MSC Cruises! Enter the zen-like atmosphere of our tranquil Aurea Spa and your mind will transform to a state of pure relaxation. Don a plush robe and relax on a teak bed in our meditation area, surrounded by glass walls with spectacular views from the top of the ship. Just next door, private spa treatment rooms await. Strewn with delicate flower petals and soft, warm lighting you can enjoy rejuvenating treatments such as a Balinese massage with lava stones, shiatsu and reflexology. Follow-up with the total relaxation of our spa's sauna, steam room and whirlpool bath. Choose a variety of treatments from Balinese massage, sauna and whirlpool to help you relax and rejuvenate in beautiful, tranquil surroundings. After your visit, you'll feel renewed and refreshed, your sense of well being restored; your mind and body reinvigorated; ready to make the most of your vacation. At MSC Cruises we offer a wide range of staterooms and suites to meet all your needs. From peaceful and comfortable interior staterooms to spacious suites with private balconies. All offer stylish features and modern conveniences to make you feel at home while on vacation. All suites offer additional space to relax and be yourself including a sitting area, a private balcony, together with Interactive TV, mini-bar, hair dryer, safe and internet connection (additional fees apply). Each suite is warm and inviting, expertly designed and exquisitely appointed. Pillow Menu - The saying goes that 'a good day follows a good night' which is why we offer all guests a pillow menu and a choice of soft, firm, down or synthetic pillow fillings. We know that it is these little luxuries that make all the difference. The bowling alley or the multi-screen sports bar? Interactive play on cutting-edge Wii consoles or at the 4D cinema, family fun in the Aqua Park and evening entertainment, from theater and cabaret to music and dance each night. Where originality meets talent; a dazzling extravaganza of shows all in one vacation. Our theater provides a truly magical ambiance for our own unique brand of surreal theatricality and outstanding world-class performances each night. Quality entertainment for quality cruising. Enjoy a game of Roulette at the casino or try your hand at the popular 'Trente et Quarante'. Have fun with Poker, Black Jack and slot machines, all in chic surroundings, or choose to dance 'til dawn in our fashionable nightclubs. A truly modern company, MSC Cruises moves with the times. This ethos is reflected in our cutting-edge onboard entertainment. A fun, young spirit permeates our onboard games and arcades such as the Formula 1 simulator, 4D cinemas and state-of-the-art sports consoles. Sailing on a magnificent ship with MSC Cruises offers oceans of adventure for your children. So why not show them the world for free or only $99? As a family owned and operated company, not only do kids sail free with us they can partake in our complimentary kids program for our guests 3-17 years of age. Our experienced Kids Club staff will keep kids entertained all day, everyday. Our Teen Club is the perfect place for kids 13 to 17 year olds to meet and have a good time with planned activities and parties. You can chill out or join in everything from sports and games tournaments to MTV-style dance classes or the Virtual World Arcade. Nighttime brings trivia and dance contests, live music and dancing. Our chefs make meals a top priority for children on all MSC cruises. Our Italian heritage means we know all about creating delicious meals and our special menus are designed to keep kids happy! Onboard MSC Preziosa, MSC Divina, MSC Splendida and MSC Fantasia you'll find an exclusive ship within a ship called MSC Yacht Club. The ultimate in luxury cruising, MSC Yacht Club offers privacy and personalized service combined with world-class leisure and entertainment. Located forward on the most desirable decks, the MSC Yacht Club is a haven of peace and refinement with exclusive butler service and a complete spectrum of private facilities to bring you an unforgettable luxury cruise experience. MSC Cruises has always enjoyed an enviable reputation for superlative service and comfort and MSC Yacht Club raises that to an entirely new level. So, why not choose this unique concept in elite cruising for a truly memorable vacation with your special someone? MSC Yacht Club is dedicated to making every aspect of your cruise a pleasure in every way, get pampered at all hours by a supremely attentive classic butler service. Enhancing the experience, everything on board is yours to enjoy and included in your many privileges as MSC Yacht Club guests. Every sumptuous suite in the MSC Yacht Club features a private balcony or a panoramic window with breathtaking views. Masterpieces of Italian style created by the renowned De Jorio Design International, MSC Yacht Club suites offer uncompromising luxury with a wealth of exclusive features. MSC Yacht Club offers a private entrance to MSC Aurea Spa. Your butler can assist with priority reservations for a wide range of exclusive wellness, beauty and massage treatments throughout the day, help pack & unpack, provide daily newspaper delivery and much more. "The MSC Yacht Club is an incredible value cruising Europe!" says Denise Blackmore, Certified Europe Specialist. "I have the most wonderful memories cruising in MSC Yacht Club to the Canary Islands. I'd highly recommend MSC Yacht Club!" The Mediterranean is more than just a destination for MSC Cruises, it's our home. That's why we know the ports of call and both the well-known and secret attractions. Our cruise itineraries will transport you to the hidden corners of history, culture and nature in the land of Roman baths, crumbling ruins, Napoleon's birthplace and sun-baked villages that are all part of the vastly diverse Mediterranean seaside. Explore ancient civilization's most amazing treasures: the haunting beauty of the ruins of Ephesus, the mighty Acropolis in Athens or the Colussus of Rhodes. Voyage through the Dardanelles to Yalta and Odessa, summer retreats of the Russian Czars. Experience the mysterious isles of Corsica and Sicily or the quaint fishing harbor of Capri, known as the Isle of Love, with its reputation among artists and poets. Feast on some of Italy's best food in Naples, float under the Bridge of Sighs on a gondola in Venice and watch a flamenco dance in Malaga, Spain. Bargain in a Turkish bazaar or North African casbah for intricate souvenirs or simply relax under the Mediterranean sun blazing over the Greek Isles. Northern Europe is a favorite destination for travellers looking for a balance of sophisticated cities and beautiful landscapes. Perhaps equally famous are the waterways in Northern Europe: from the Norwegian fjords to Finland's archipelagos. Summer is high season, with long Scandinavian days where the sun can shine for almost 24 hours straight. Many of our Northern European cruises depart and/or finish in Copenhagen, Denmark's fairy tale like capital city where bicycles coast alongside cars and the scent of baked goods emanates from storefronts. Enjoy a Baltic Capitals cruise where a sweeping tour includes some of Europe's most glorious cities. Navigate the narrow waterways and medieval streets of Stockholm, a quaint city built on 14 small islands. Explore Tallinn, the primary tourist destination and capital of Estonia, and it's Old Town, a UNESCO World Heritage Site. Explore the cultural history of St. Petersburg, Peter the Great's Window on Europe and Helsinki, a scenic city overlooking the Gulf of Finland with long summer days and a warm, welcoming and well-educated population. If you ever feel like there aren't enough hours in the day, visit the Land of the Midnight Sun. Norwegian Fjord and Midnight Sun cruises offer up to 20 hour days, touring glaciers, lakes and mountains. Going beyond the charming capital city of Oslo towards the western region for the best fjord viewing locations are Flaam and Geiranger. Bergen, a beautiful waterside city, is full of all the culture, shopping and manmade pleasures to complement the natural resources of this magnificent land.